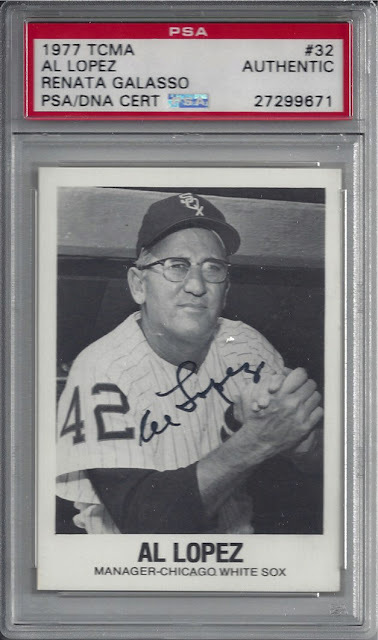 Just a quick post today but wanted to share a new pick up for the Hall of Famer baseball autograph collection. I set a goal to pick up 5 new players this year and in looking through the list of guys I need, there aren't a lot of low price options available. One guy on the list I decided to seek out was Al Lopez. Lopez was elected to the Hall of Fame in 1977 by the Veterans Committee and while I believe he was primarily selected for his managerial career, he was a very good player as well. As a player he set the record for most games played as a catcher with 1918, a record that stood for quite some time. He was a two-time All-Star and played for the Brooklyn Robins/Dodgers, Boston Bees, Pittsburgh Pirates and Cleveland Indians between 1928 and 1947. As a manager, he never had a losing season in either the major or minor leagues. He has a .584 winning percentage which puts him in the top 10 all time. And a crazy Yankee trivia fact, his 1954 Indians and 1959 White Sox teams were the only non-Yankee clubs to win the AL pennant between 1949 and 1964. The card I picked up is a PSA certified autograph on a 1977 TCMA Renata Galasso card. It features a nice black and white photo and he autographed the card across the chest. He is listed as a manager and is wearing a #42 White Sox jersey, a team he still sits in 2nd place on the all time wins list for. I had to go the route of a card like this because Lopez passed away in 2005 and to the best of my knowledge his only pack released autos are cut autos. I think a card like this displays much better than most cut autos. According to beckett.com, he has 71 different released autograph cards and based on my quick math a total print run of just under 700 cards. His auto isn't rare and this card didn't break the bank. I am happy to have this card in my collection and I am now 20% done with a 2019 goal! Congratulations on adding his autograph to your collection! The simple card design really makes the autograph stand out. My Past Time....I Love It!!! I am an avid sports card collector and enjoy building sets, team collecting and player collecting. This blog is my attempt to dive deeper into the blog world to rid myself of cards that don't fit into my collection and add gems that do.